the uvee seams splitting - has it anything to do with the 'neighbour verticie' settings? 480K is a heck of a lot of polys. Okay for a "hero" tree, but less so for a jobbing tree in mixed woodland. Yep, that is way too excessive for a tree with such a low detail, no big trade secrets there either, as far as I can see, looks like Carrara's metaballs generated tree converted to a model with needlesly high amount of polygons. I use TreeSketch app on my Ipad, pretty happy with it, usually mid detail trees are like 25k polygons (they are quads too, so relatively easy to edit in Carrara or Silo), they are using transmaps though, not Carrara's favorite thing to render. I have and like TreeSketch too, can get some cool tree shapes! Thanks for the tips on Treesketch. @Headwax - appreciate the feedback on that plugin which shall not be named. Interesting idea about using to supplement dam. Similar idea to using physics. Site says it is for IPad. How does one export an obj from an IPad to be used on a computer? My computer is Windows, not Mac. I do own an IPad. 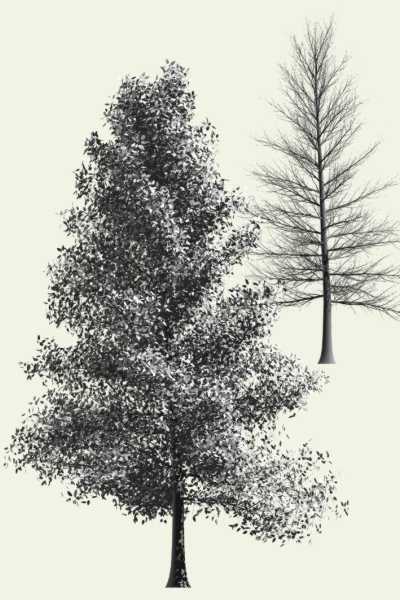 TreeSketch is a fully featured interactive 3D tree modelling application for your iPad. Creating a tree is as simple as painting on the screen while watching the tree grow into your stroke. TreeSketch is powerful enough to capture a stunning variety of tree forms.TreeSketch exports 3D models to .FBX and .OBJ so they can be used by all major rendering applications.Best of all, its free! Here is a site that compares botanical software and plugins. Any thoughts or suggestions? Site says it is for IPad. How does one export an obj from an IPad to be used on a computer? Copying a Bryce forum discussion on tree and plant programs here for future reference. Arbaro looks interesting. Fun with the terrain modeler. 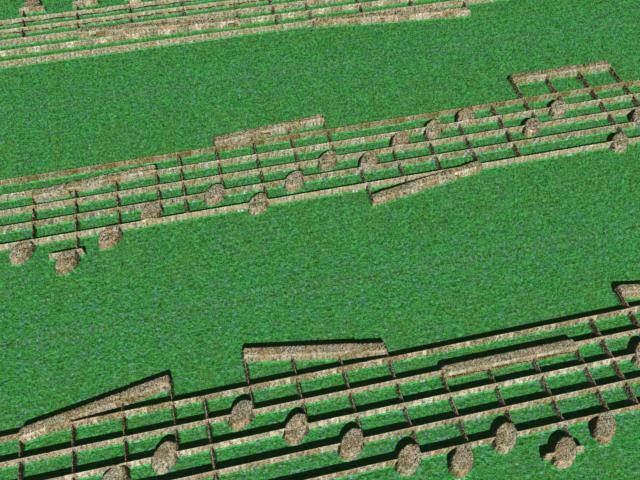 In another thrread, I offered a suggestion to use the terrain modeler for music scores. I will illusrate it here. Although this is for music, the idea can be used for other objects, such as picture frames. The concept is to import an image file to the terrain modeler and then use the shader tree to hide what you don't want. 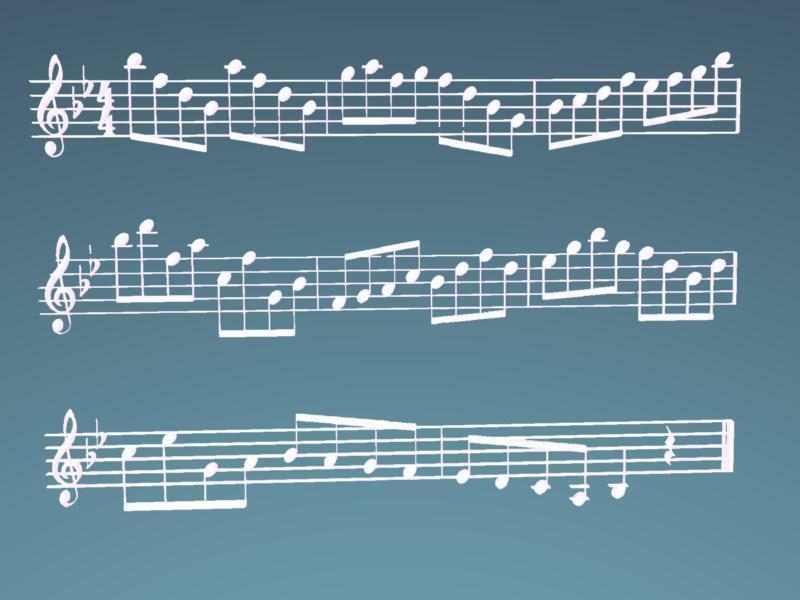 In this example, I will use some sheet music that I found on the web. In this example, my reference image is the wrong color. I need to invert it so that the bars and notes are white while the background is black. Accomplish this task in Photoshop, Gimp, or other image editor of your choice. In Carrara, insert a terrain. Change the default dimensions to better match the image, in this case a rectangle. 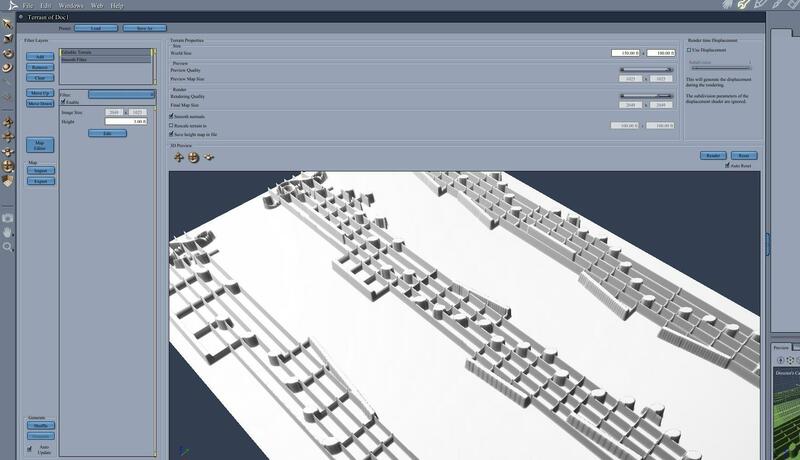 Load the image in the terrain modeler and reduce the elevation height from 30 feet to 3 or 5 feet. Also apply a smoothing filter. In the assmble room, you will see that the shape is OK, but the default shader does not look very good. We want to apply an alpha to the lower elevation and a white shader to the bars and notes. Convert the shader to a complex shader: layer list. Later list elements overwrite earlier entries. So in this case, it is best to apply an alpha shader to make the whole object invisible and then use another layer to overwrite where the object is supposed to appear. In the top layer, change the alpha channel to black or zero. In the second layer change the color and glow channels to white. The key will be the opacity mask for the second layer. It should only apply to the elevated elements. The best way to accomplish this is to open the opacity mask channel, choose environmental, and then choose elevation. Set the elevation to 1 foot. Now, any parts of the object below 1 foot still have the first layer, which is the invisible alpha. Any parts of the object above 1 foot get the second layer, which is the white color and glow. EDIT: Make sure the elevation function is set to LOCAL, not global. In the assemble room, the object will appear to only have one layer. But when rendered against a background (in this example, I made the background blue), it will look correct. And here is the same model, but with a grass shader applied to the first layer and a stone shader applied to the second layer. Some of you may know that I work in Washington, DC on financial regulatory issues. I have had a non-partisan job, focused mostly on providing research and education to policymakers. The current atmosphere in Washington has become too toxic for me. There are going to be some big changes in my life. I have accepted a job to do some free-lance writing for a think tank, and then in the Fall I have accepted an offer to teach a university class. I have not made a final decison, but I think I may move away from DC after I finish teaching the class, even though they said that I could continue with more classes in 2018. The bottom line is that I will be spending a lot more time on my 3D hobby in the very short run, but probably a lot less time when I have to deal with all these changes. I may have to act like a lawyer. Ugh. I will take a little time just for me. A couple of years ago, I did a vacation drive along the Pacific Coast Highway from Seattle to San Diego. Might do something similar around baseball's spring training facilities in Florida. When you said exciting times, I thought of that Chinese curse. But Wikipedia has its doubts. "Chinese curse" redirects here. For Chinese-language profanity, see Mandarin Chinese profanity. "May you live in interesting times" is an English expression purported to be a translation of a traditional Chinese curse. While seemingly a blessing, the expression is always used ironically, with the clear implication that 'uninteresting times', of peace and tranquillity, are more life-enhancing than interesting ones, which from historical perspective usually include disorder and conflict. It was meant positively, but you can take it how you like! That Pacific Coast holiday sounds like an adventure. I had a couple of business trips to the Pacific Coast many moons ago, to Seattle and to San Francisco, really enjoyed both cities. ...kind of explains the recent turning to the Dark Darth (ed) Side, eh? You know we all love you, diomede64! Yeah... we even remember your real name! I was put in mind more of the Pratchett novel, Interesting Times -- https://en.wikipedia.org/wiki/Interesting_Times (which we did on stage some years ago, great fun!). Still very much a book for our time.